Okay, I’ll admit it… I’m an absolute lumber jock! I enjoy watching DIY shows taking place in an old musty workshop. Of these, I’ve been a huge fan of the Yankee Workshop featuring Norm Abrams. A lot of the techniques he’s taught on his show over the years has helped me in my own projects. 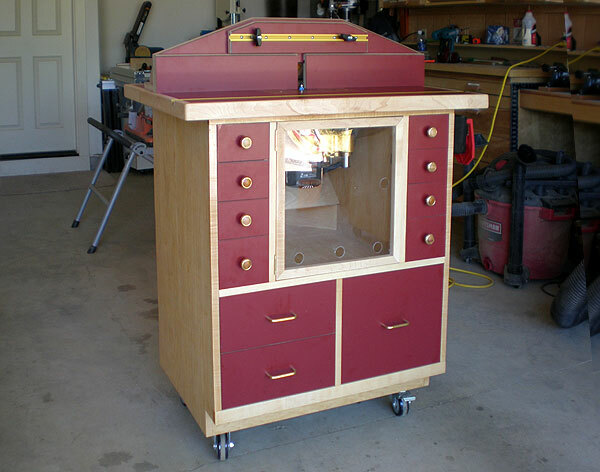 I’ve always been a big fan of his work on his custom-built router table. 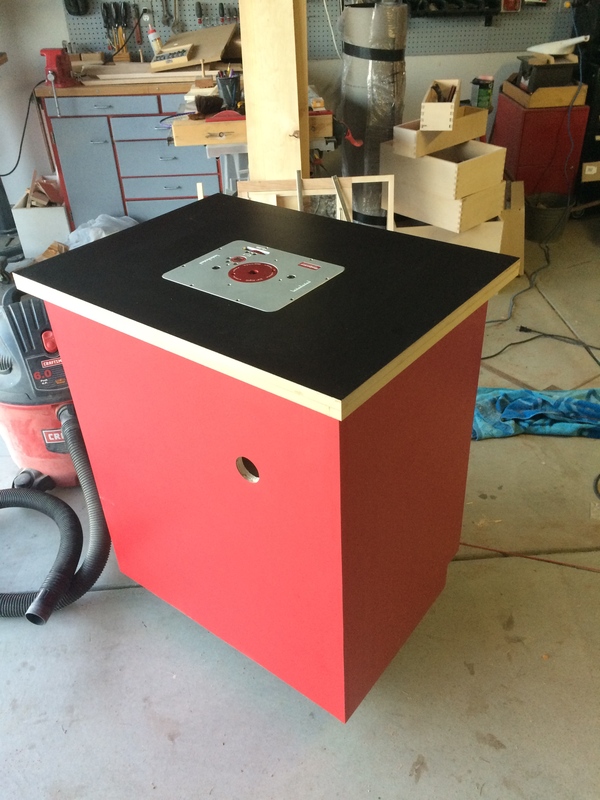 I decided to build my own Ultimate Router Table inspired by Norm’s design. 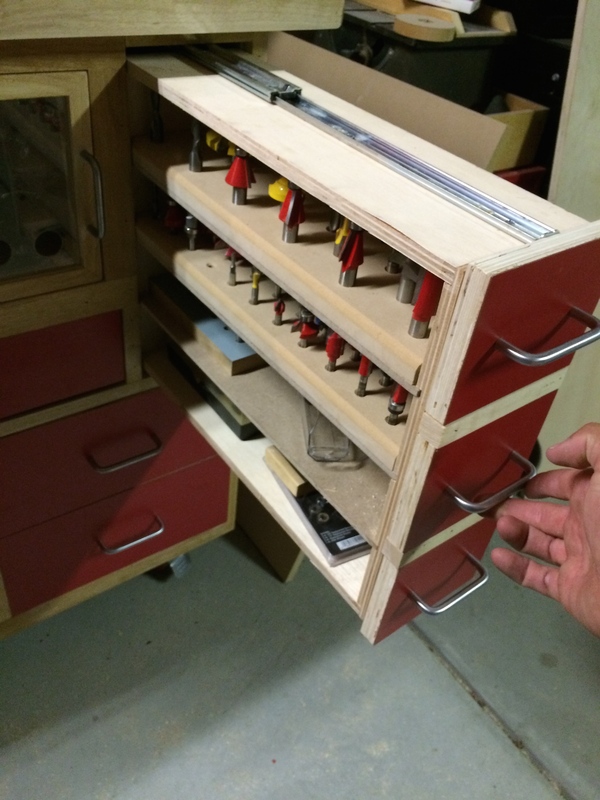 I love all the storage space and decided to add a center drawer under my router lift for tool storage. 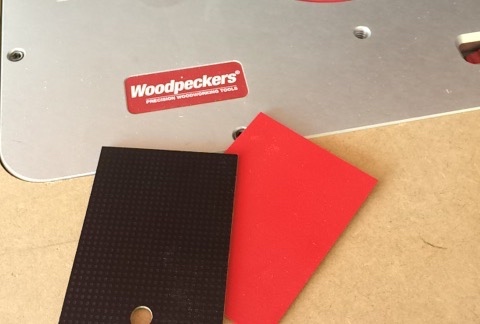 My good friends at Woodpeckers Precision Tools set me up with the perfect lift! 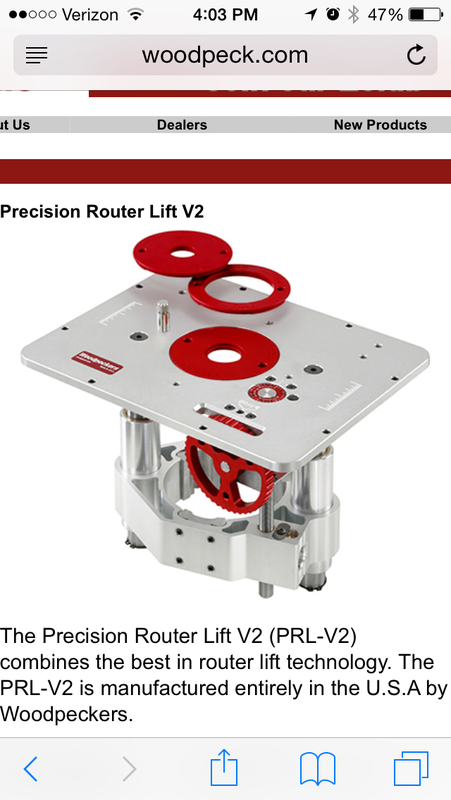 Its the Woodpeckers Precision Router Lift V2. 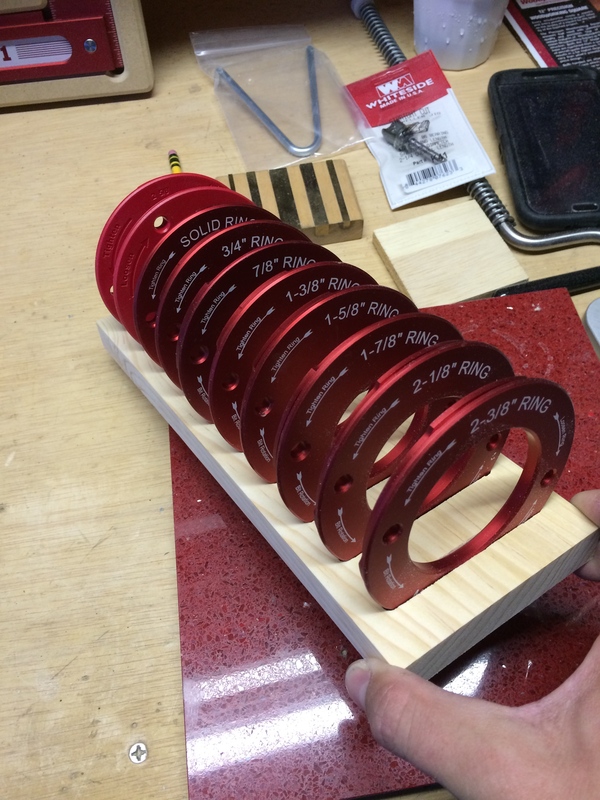 They were kind enough to help add to my purchase with the custom aluminum rings…What can I say, I’ve got a soft spot for shiny red things! 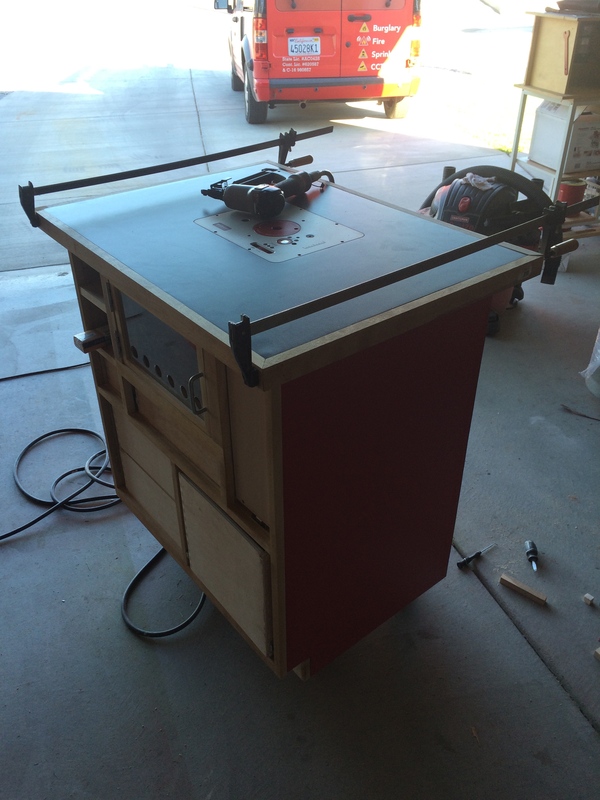 The lift houses my Porter Cable 960. 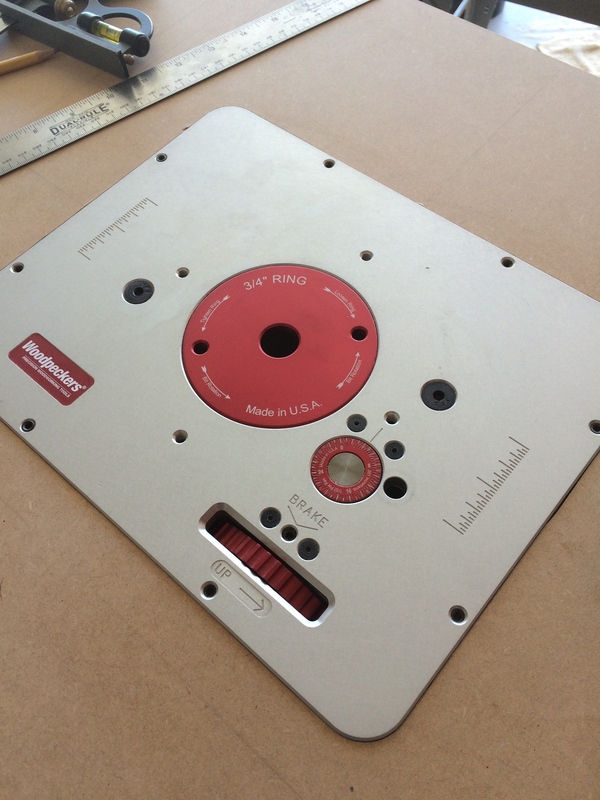 Its plenty of motor for the stuff I shape and is one of the best routers on the market! 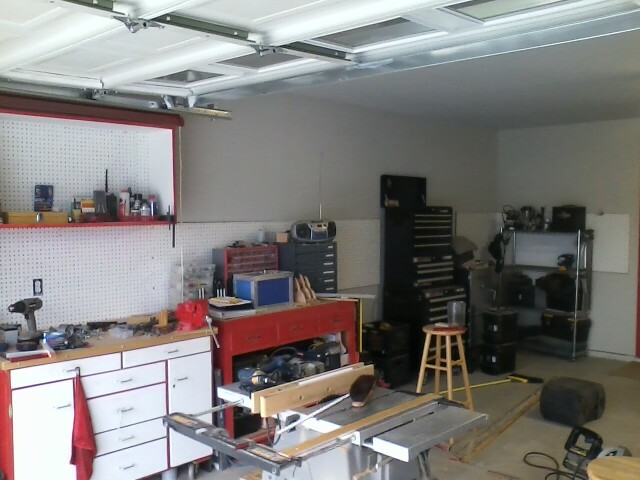 Our garage is a very spacious two-car garage with lots of wall space. 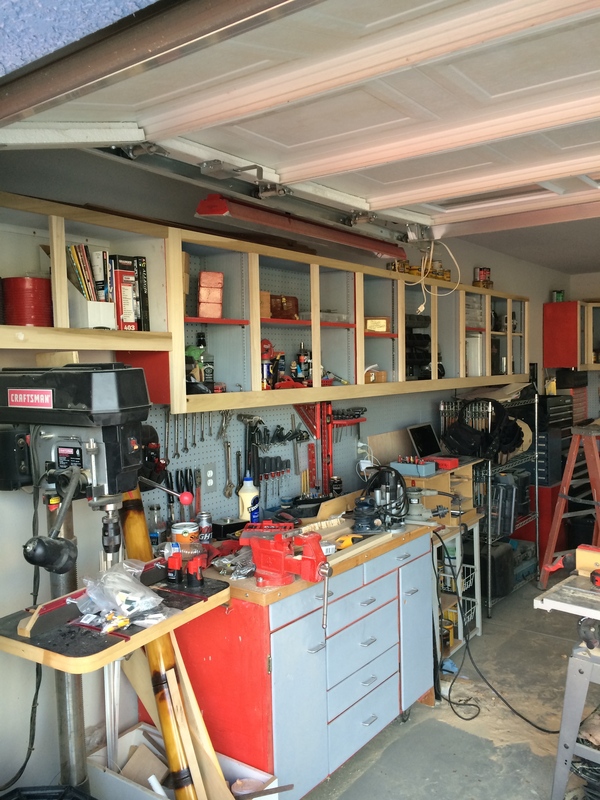 I dedicated one wall to be my workbench and storage space. 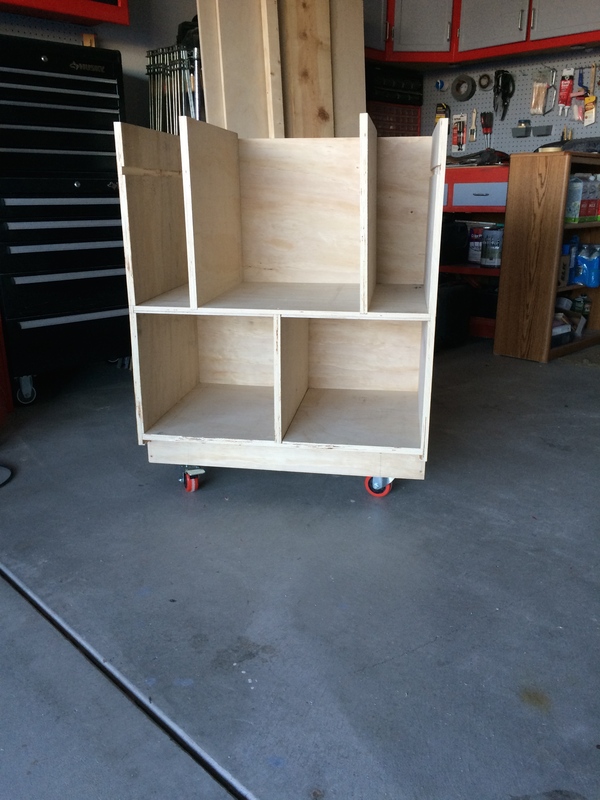 The other walls already house storage racks to store my wife’s teaching supplies, all of my illusion show ATA cases, kayaks, yard tools, and my sons bike and go-kart. 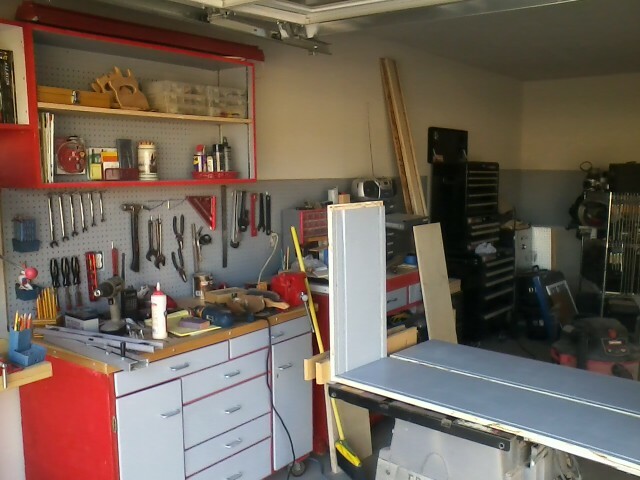 We still plan to keep it as a fully accessible place to park our cars so I cannot consume the entire garage with all of my tools, etc. 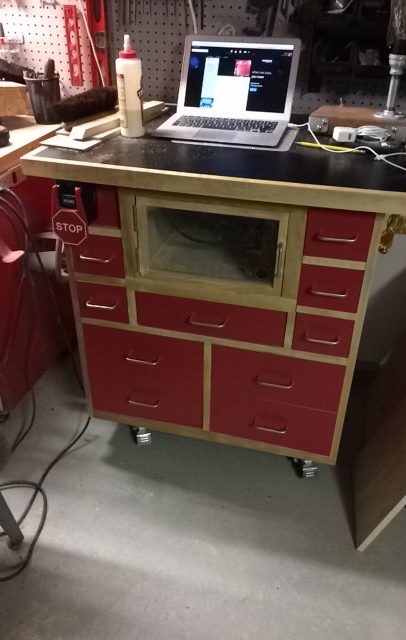 Previously, my workbench space included a reclaimed cabinet that doesn’t have doors and a makeshift top covered in MDO. 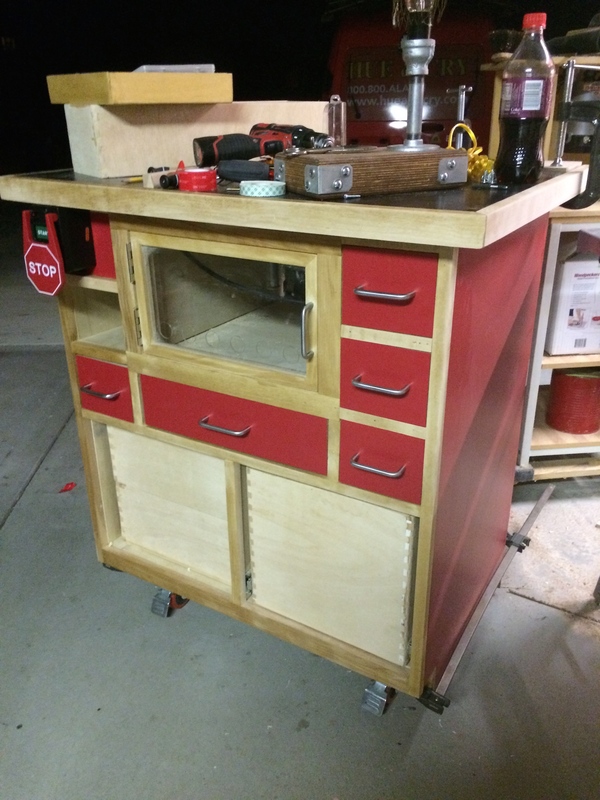 I also sanded and painted and installed a hardwood work surface on a roll-around cart my dad had in his garage. 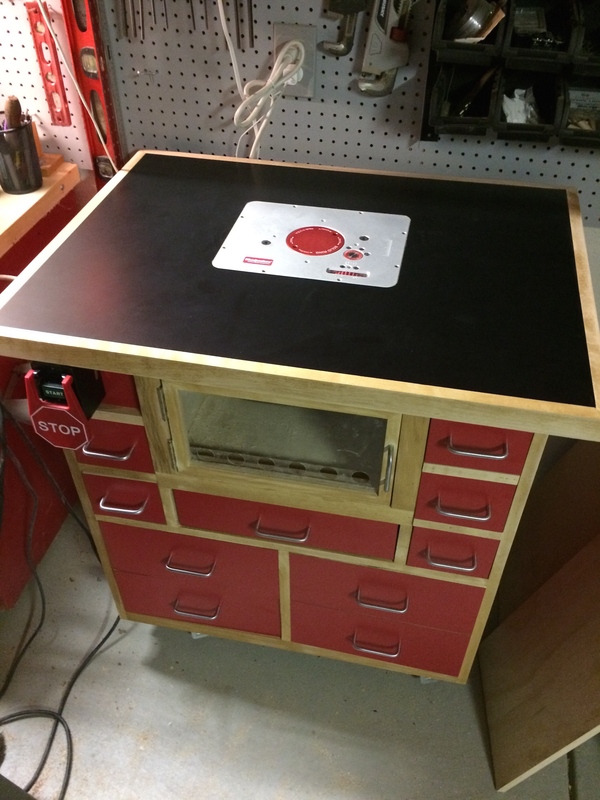 So far, this works perfect for all of my table saw and router jigs, paint and wood stain (I vented it out the back), and air tool storage. 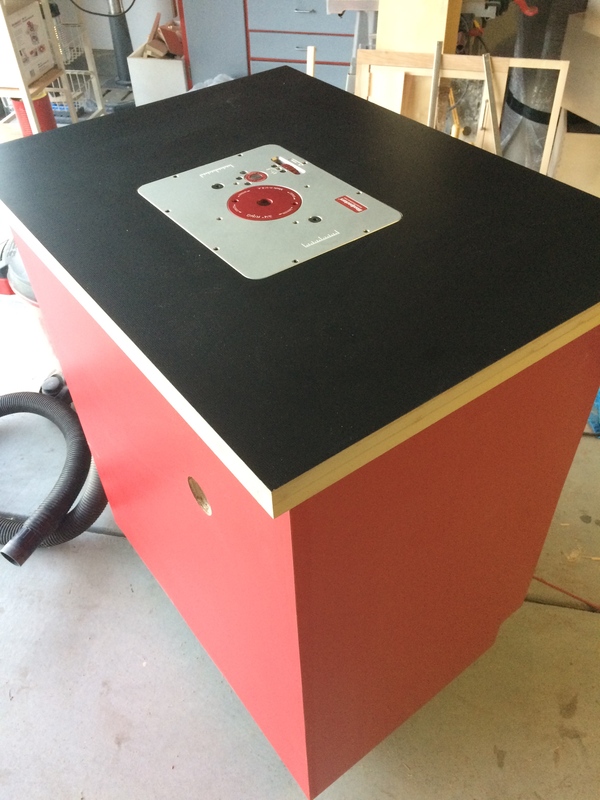 I have yet to permanently mount my bench vice as you will notice in the photos below. 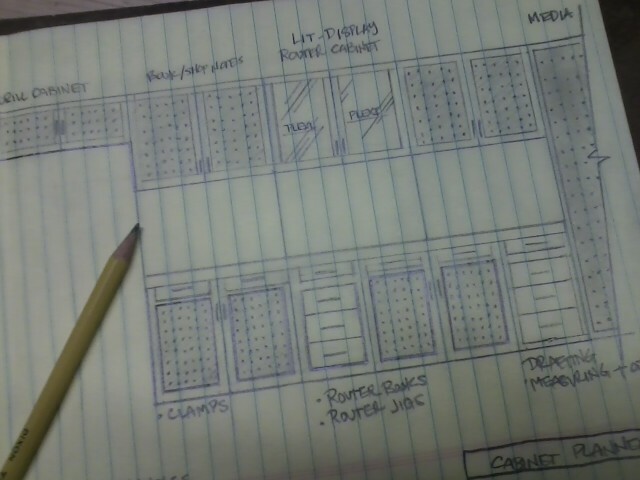 I sketched out a rough design of what I wanted my workbench area to look like and went from there. 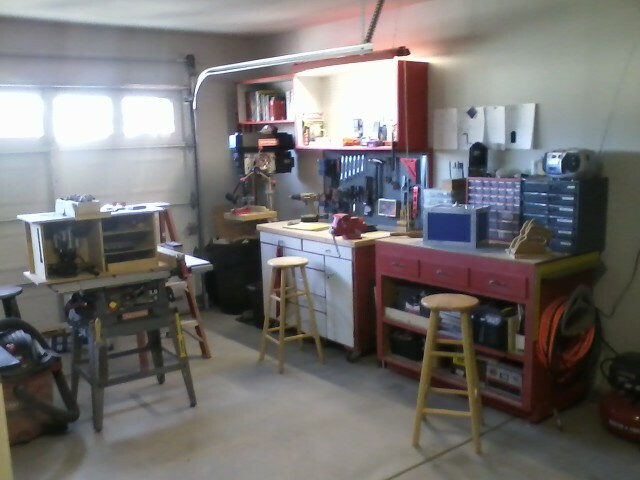 Afterall, this isnt just going to be my “tinker area!” It’s sort of my man cave! 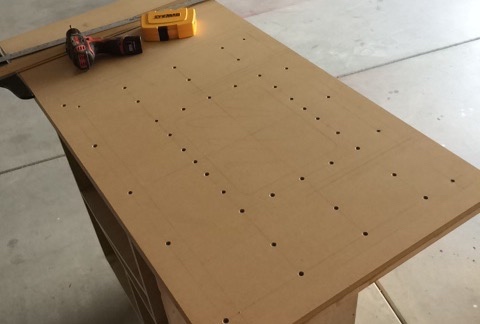 I plan to frame pegboard with a door skin backing (so sawdust will not get in) on each door. I figured this would look sharp! 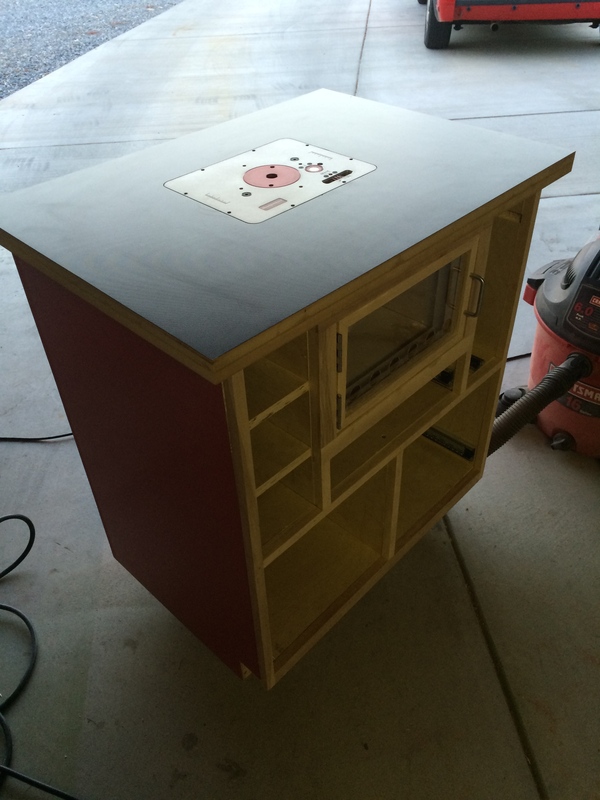 Notice the plexi doors. 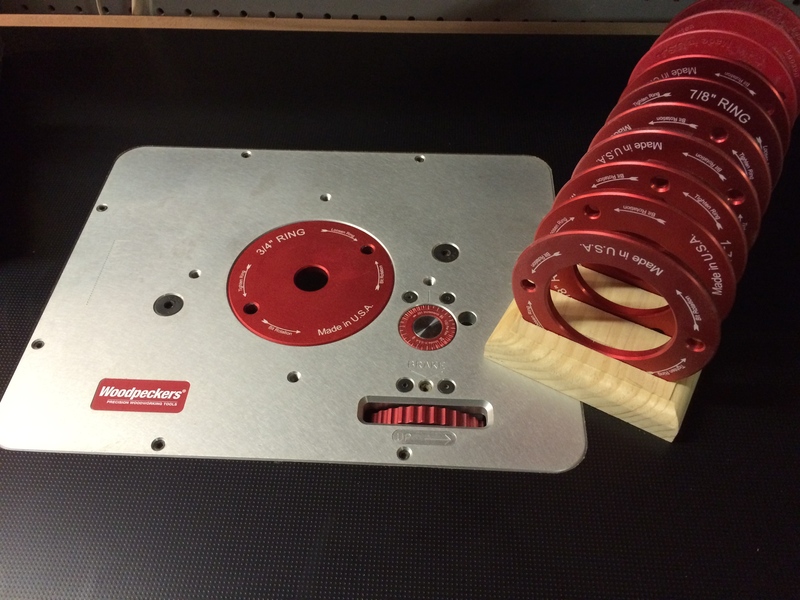 I want to display my routers as well as have ample storage space for them. 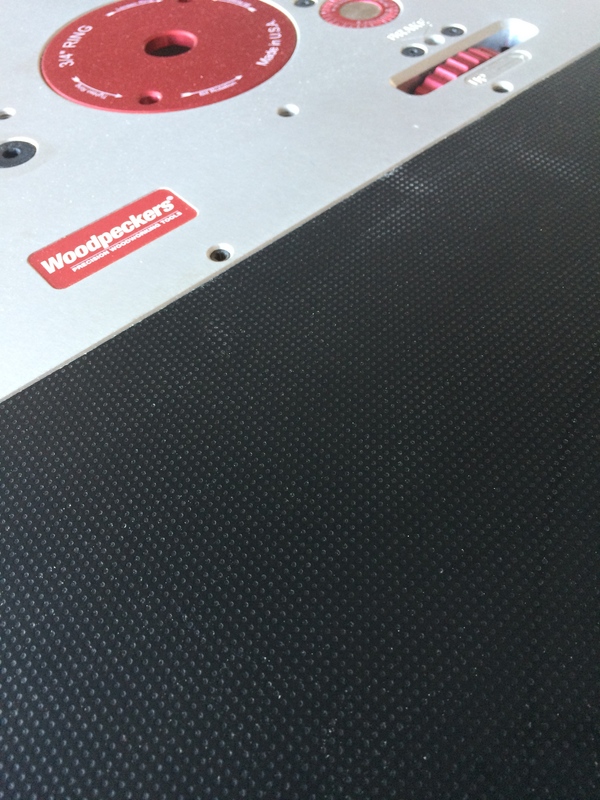 My dad cherished his routers and was like a child in a candy shop when he discovered a new use for them. I think it will be cool to sort of “highlight” them in my shop. 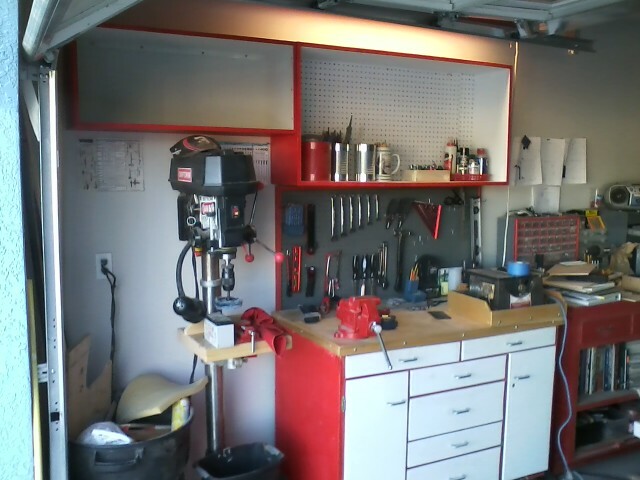 I built and installed the two cupboards (one over the drill press and the other over my roll-around workbench) I’ve decided to stick with the Craftsman, Porter Cable, Husky Tools, etc color motif and paint everything red, grey, dark grey, and black. 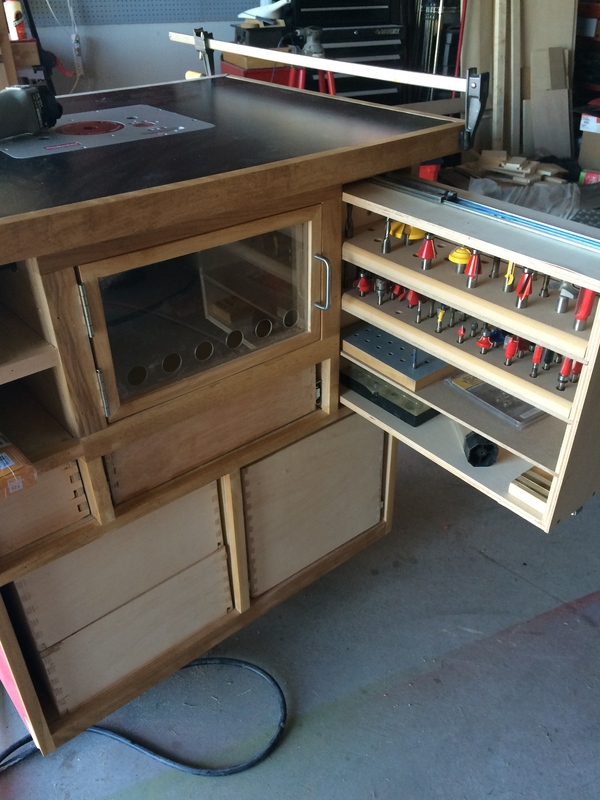 All the drawer handles are brushed aluminum. 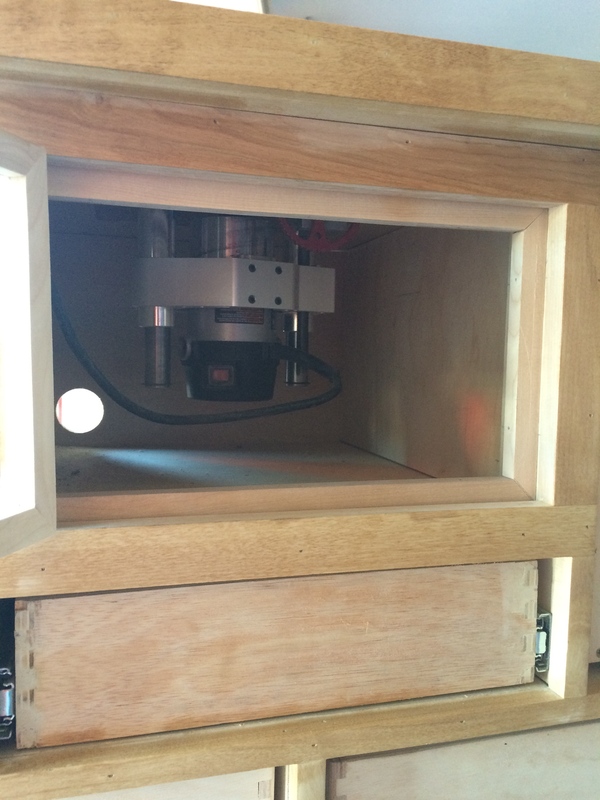 The cupboard over the drill press will eventually feature two drill indexes. 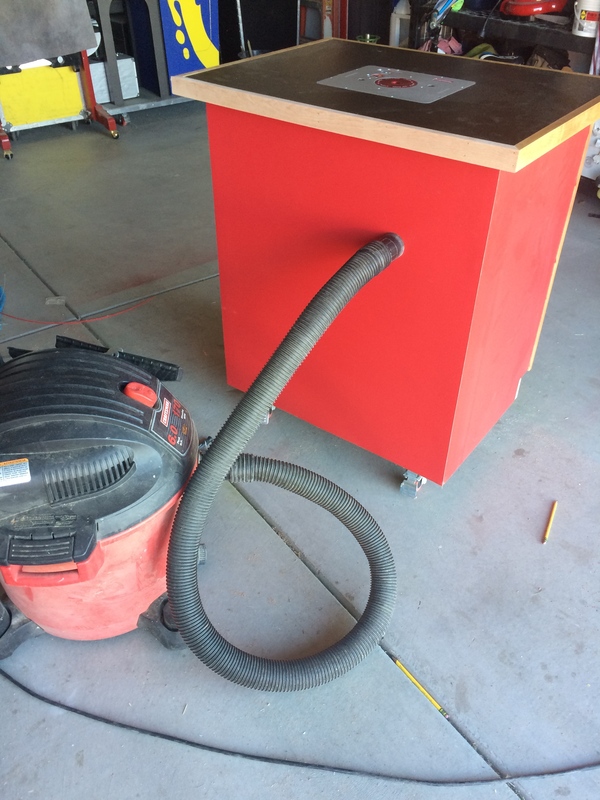 One for the spade bits, and the other for standard drill bits; as well as storage space for additional items I constantly use on the drill press such as the buffing/ polishing wheels, etc. 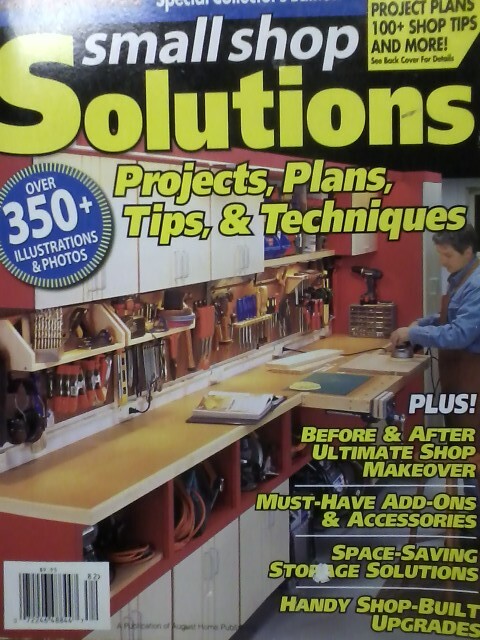 For now, its a storage for all of my woodworking books. 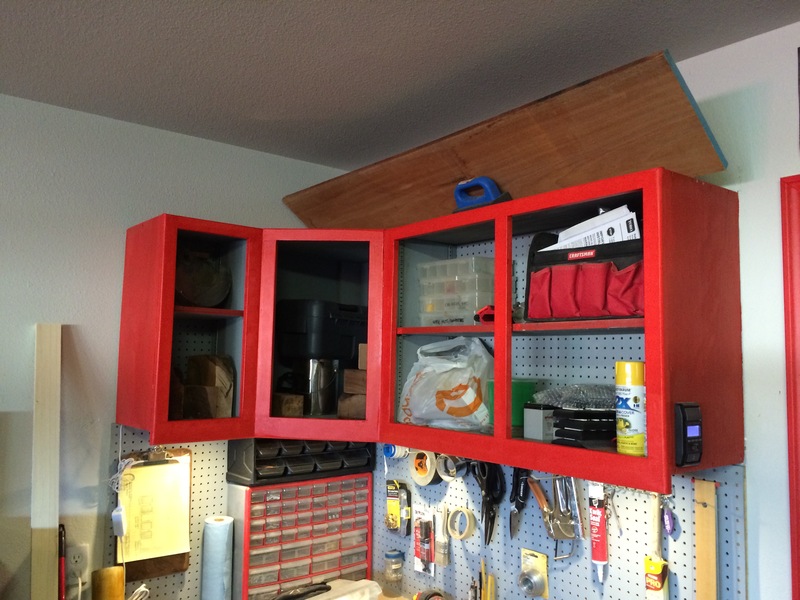 Next, I installed some (much needed) pegboard under the cupboards and above where I plan to build a 12′ long workbench with more storage cabinets and drawers. 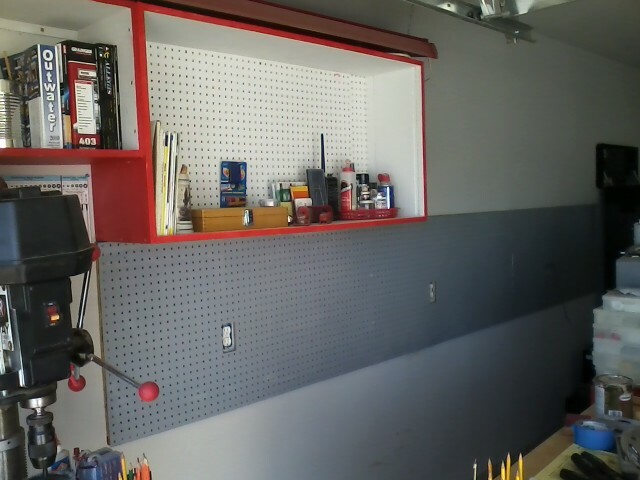 To keep with my color scheme, I painted all of the pegboard a medium grey. 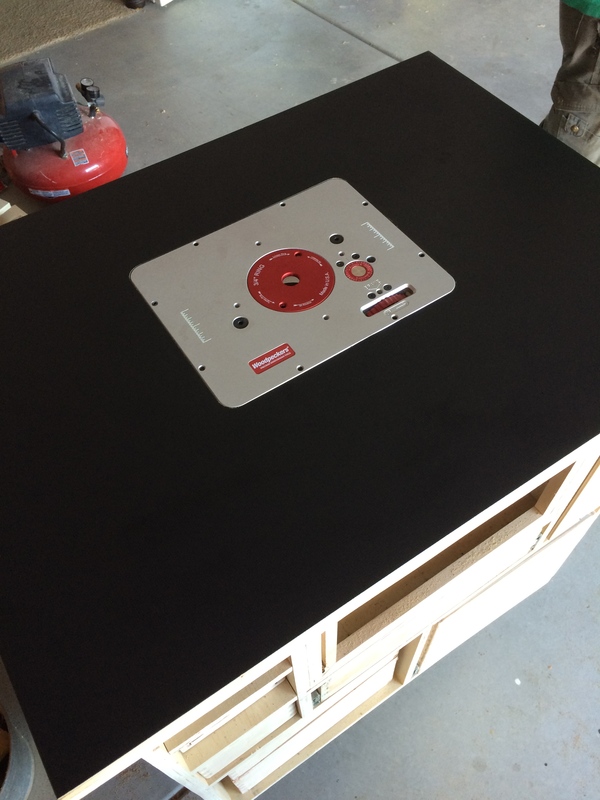 The electrical outlets will be extended out as diamond-plate cover plates will ride flush on the pegboard. 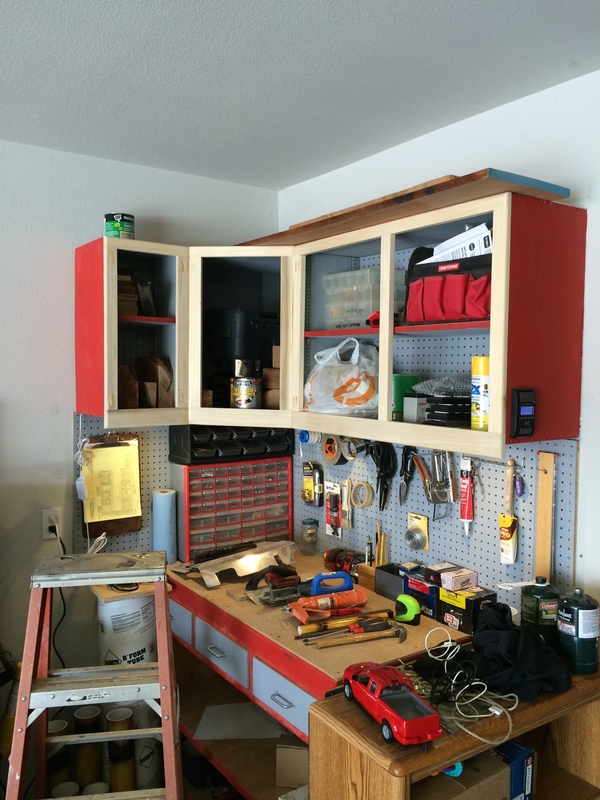 In this photo, you can see the cupboard is now painted to match the pegboard below. 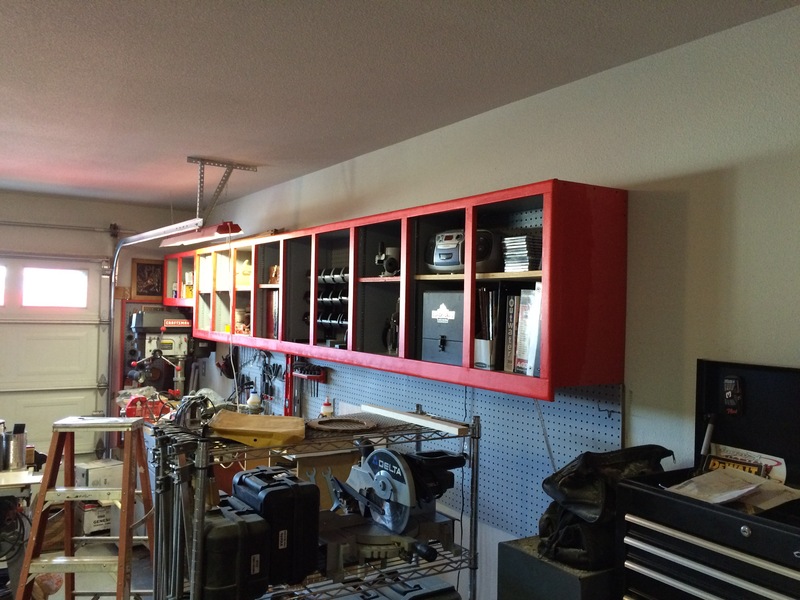 I also installed the shelf rails and an adjustable shelf. 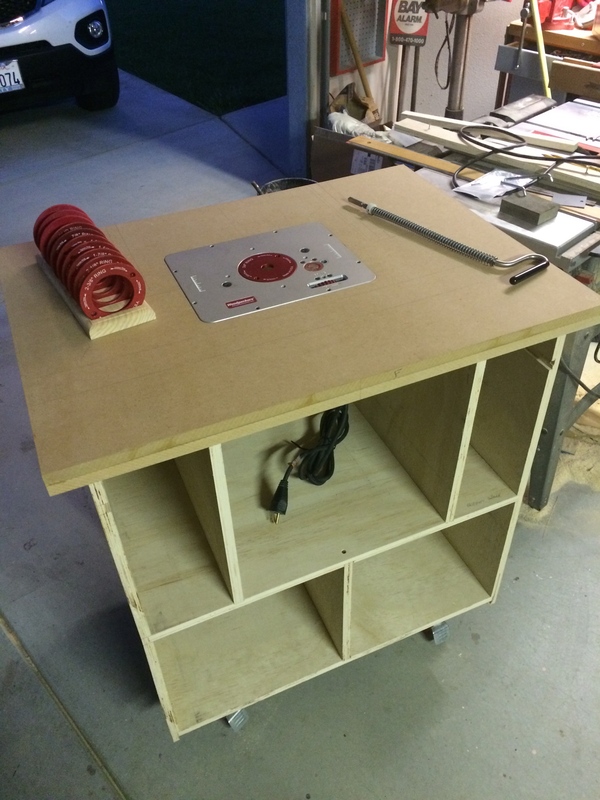 The next cupboard is sitting on my table saw ready for assembly. Wow! 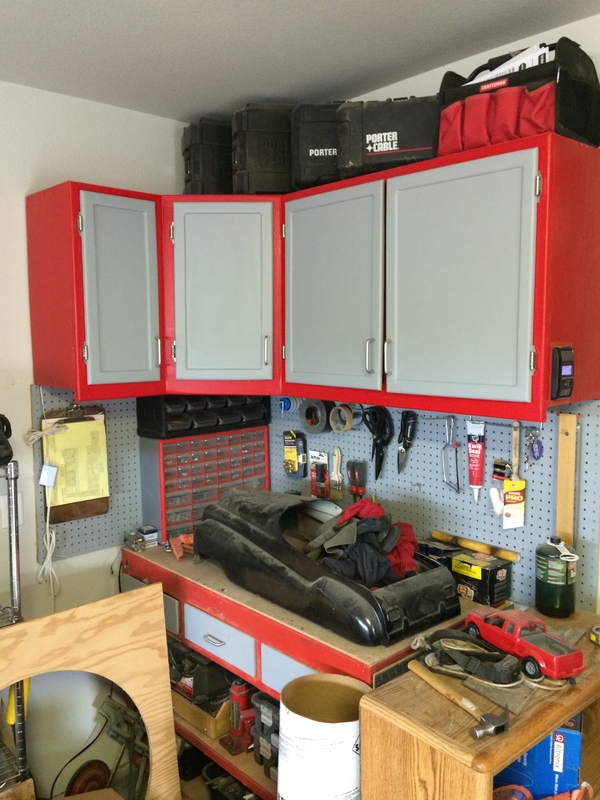 Less clutter! 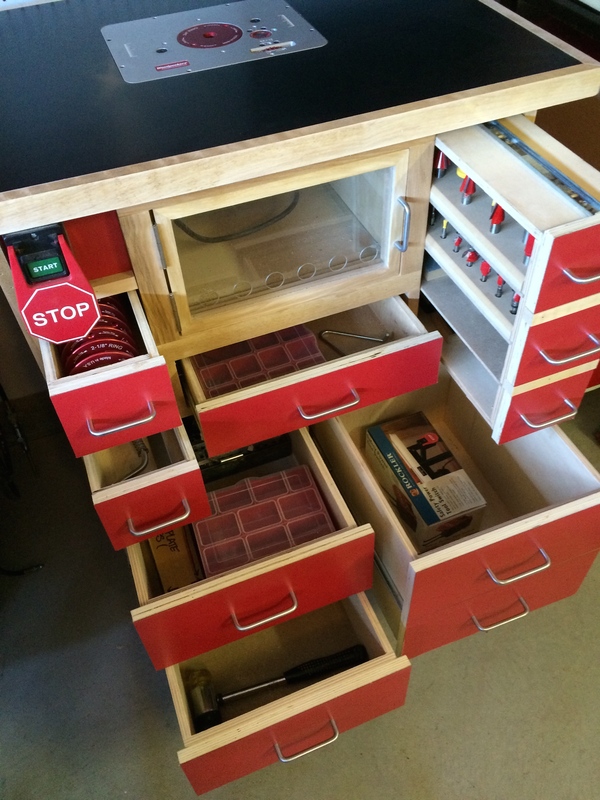 – I mounted the third (of six) cupboards and picked up the workbench area. 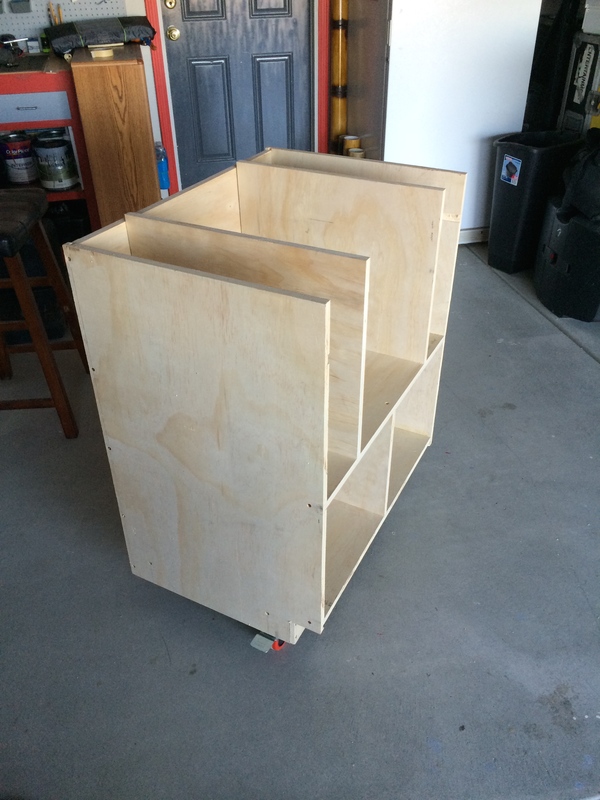 Eventually when all of the cupboards are in place, I plan to frame them in and put doors on all of them. 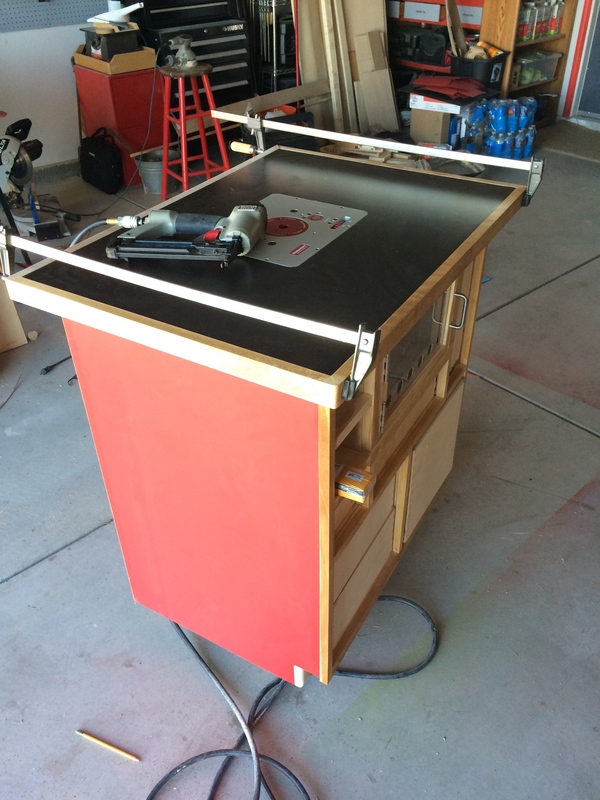 The underside will also include a non-visible LED rope light to illuminate the pegboard and help make it easier to see the workbench top! 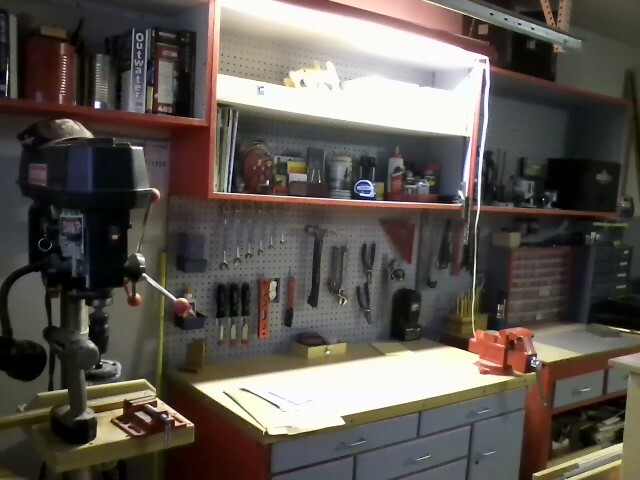 Another view (this time without the temporary florescent light to help reduce the bad glare). The fourth shelf is now up! 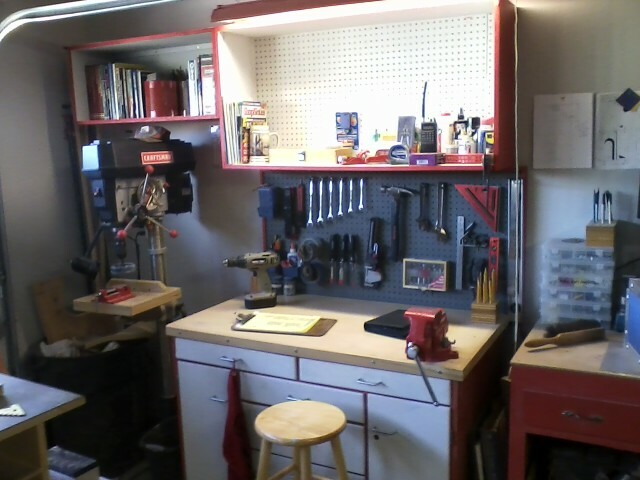 A view of my clustered area with the table saw, router table, and scrap lumber. 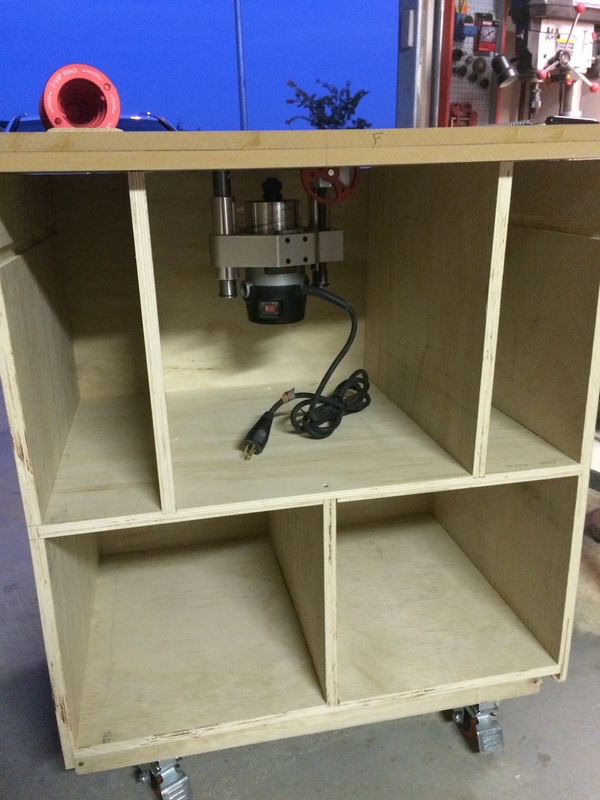 I’ve begun assembly on a corner cupboard. 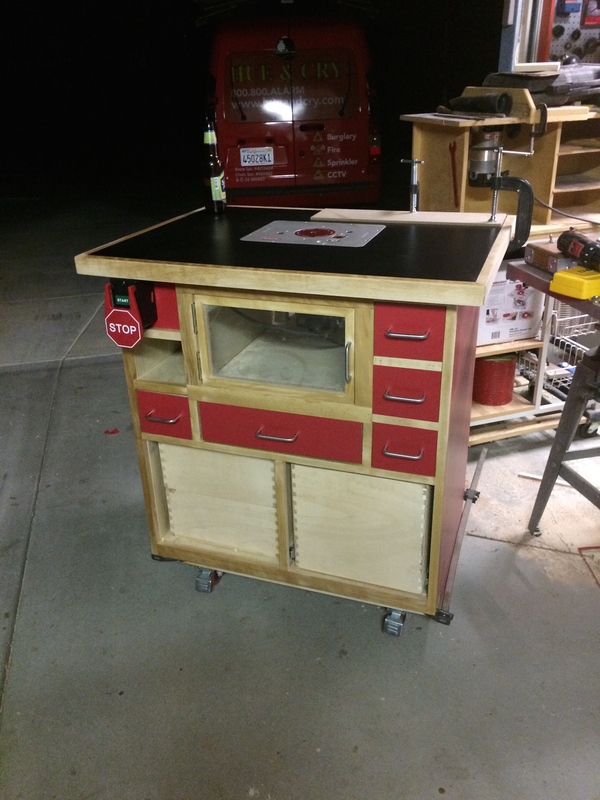 this will house all of my wife’s crafting supplies, etc. 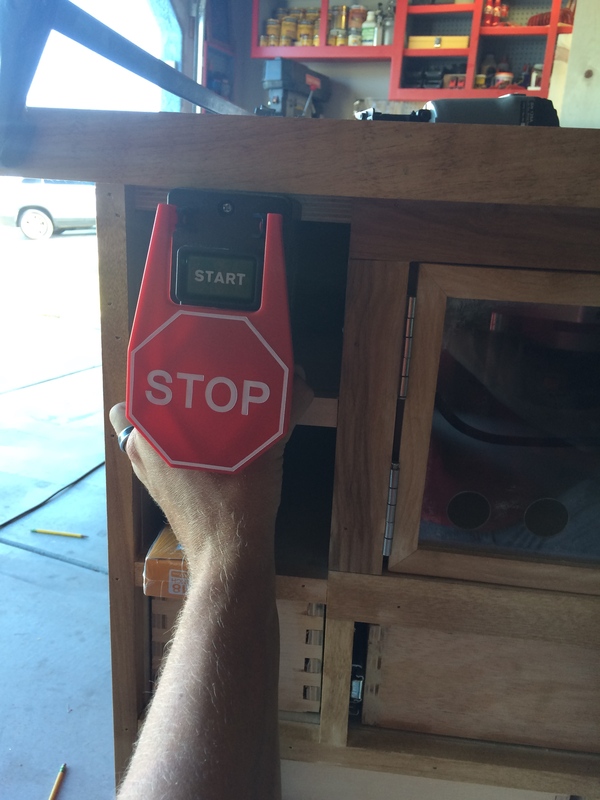 above a small workbench I’m building for her to do her Pinterest projects at. 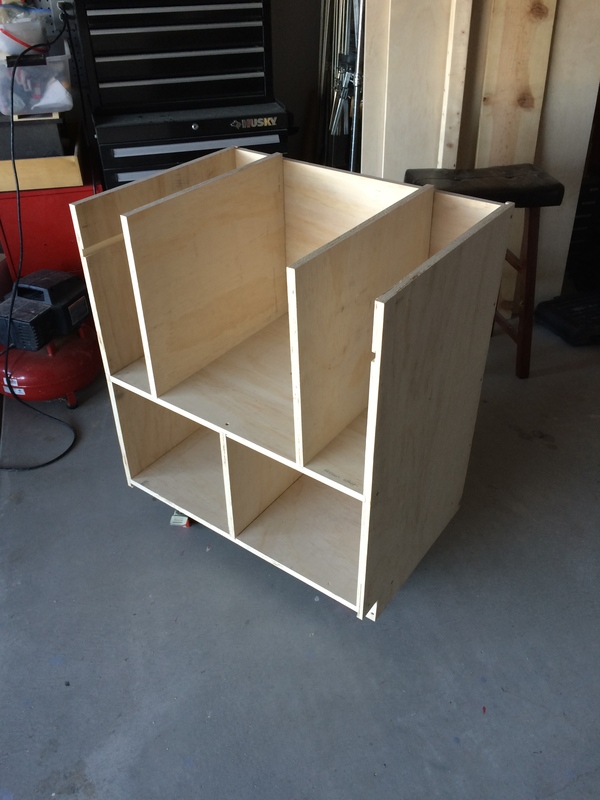 The corner cupboard is now framed in and ready for primer and paint. 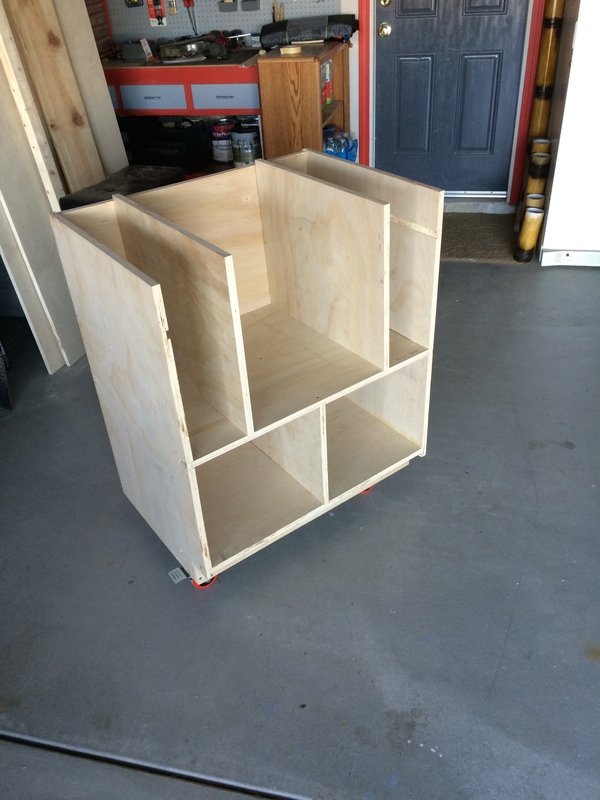 The main cupboards are framed in and ready for primer and paint… then doors!!! 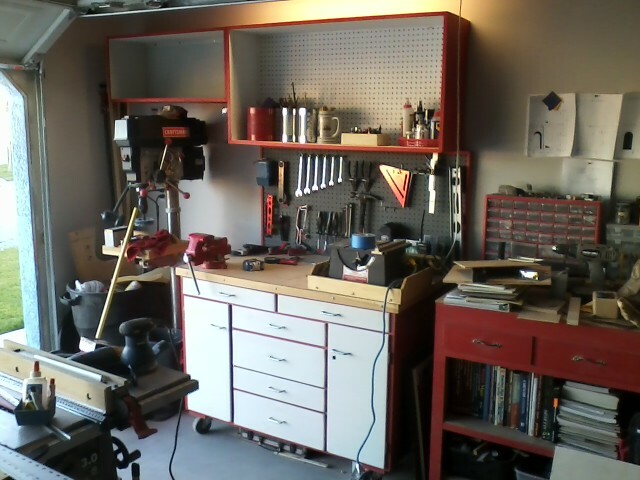 My messy workshop… the frames are all primered and ready for the red paint. 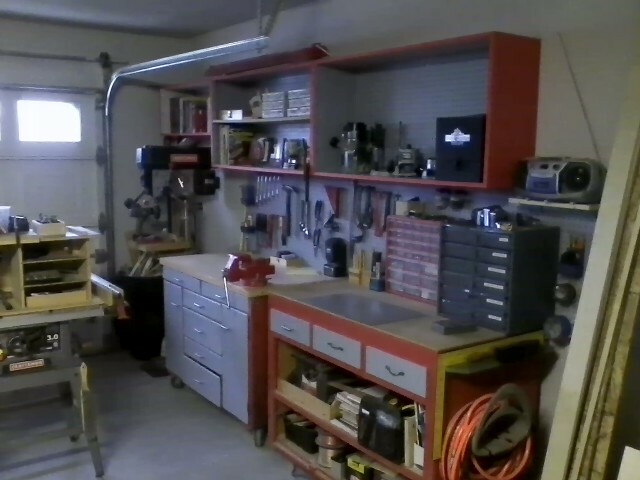 Cupboard doors will go on next then I can begin assembly of the workbench and cabinets below. 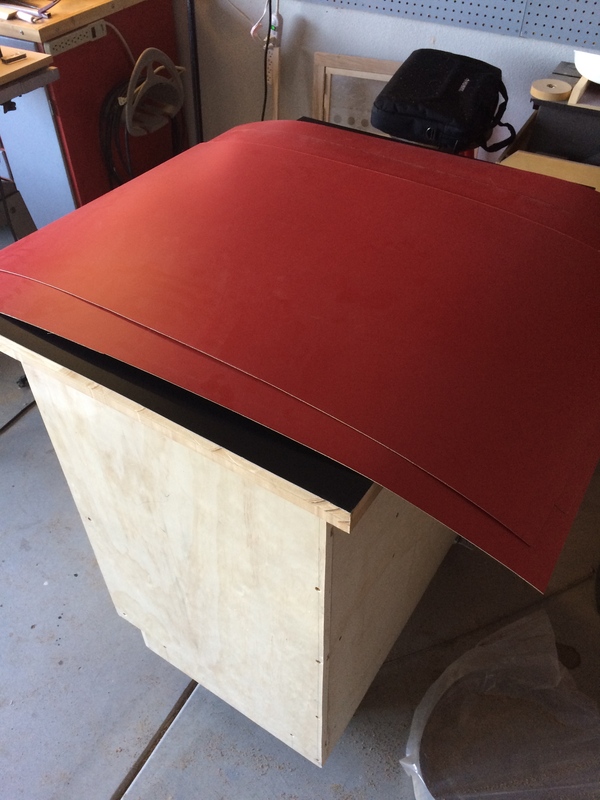 The corner cupboard frame is now painted. 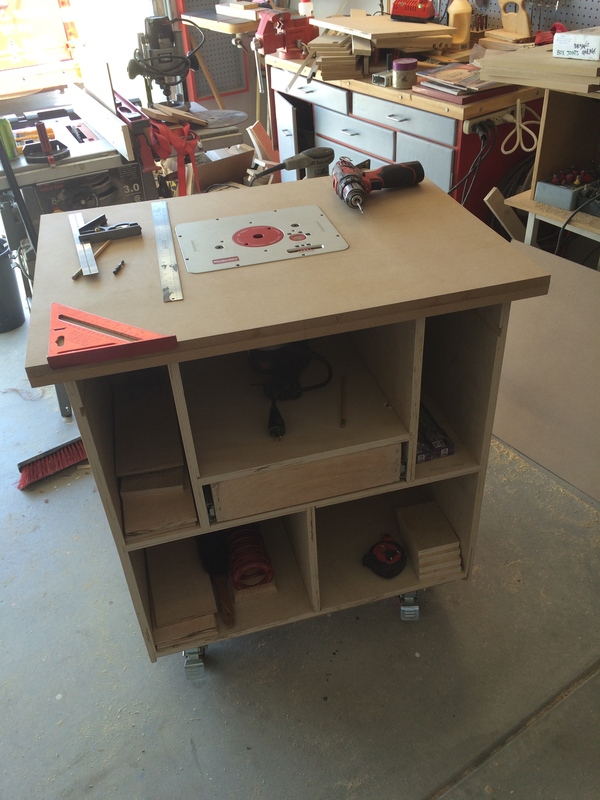 …as well as the main workshop cupboards. Looking much better! Now I really need to start eliminating some of this clutter! 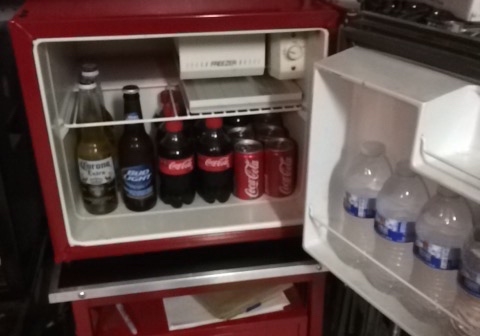 Every workshop needs a good beer & soda fridge. 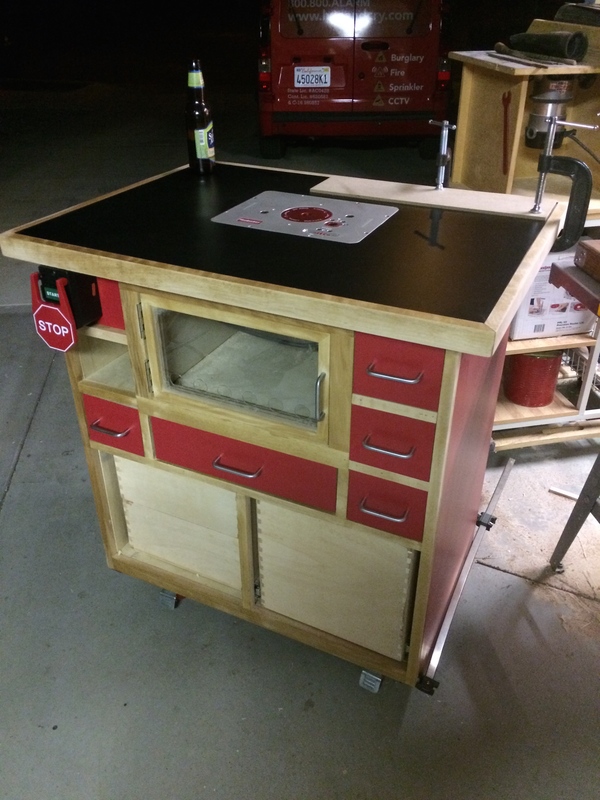 This is the one I built from a small refrigerator my wife was going to toss out. 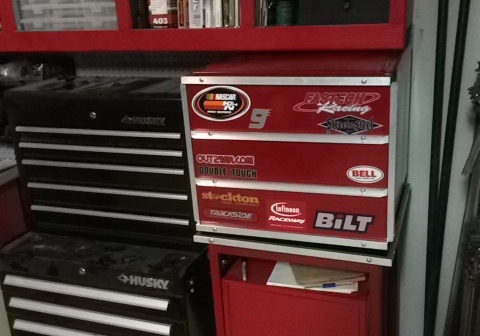 I gave it a few passes with some rattle-can red and trimmed it out with enough aluminum to make Doug Malloy proud- complimented it with some racing decals!